Today is the last day you can get this pattern for free. Why? It’s part of the 2018 CGOA NatCroMo celebration and this one is free for everyone—CGOA members and nonmembers. Shining Day is crocheted in a lacy stitch pattern that is flowing wonderfully off my [pink] hook. I think it flows so much because you crochet into chain spaces at an easy gauge. 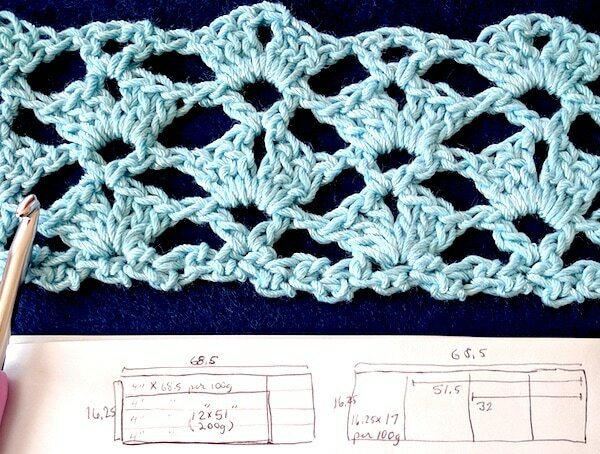 This wide lacy rectangle is worked from the center out on both sides of the foundation row. You’ll have matching ends, each with a pretty picot border. For a design like this, you wouldn’t want the foundation chains to look noticeable or feel tighter than the rest of its flowing lace. No problem! Andee uses a great type of foundation row. It’s not only stretchy, it has a nice texture that blends in. Andee used four 100g. balls of Lotus to get a wrap that is 16.25″ X 68.5″. Four balls is 1,024 yds (4 X 256 yds). One of several springtime color combos! In my recent newsletter issue #90, I mentioned a multicolored Shining Day using a six-pack of Lotus Snacks. I think spring fever made me do it. I kept picturing a riot of floral colors like I do every spring. Unfortunately I miscalculated the yarn amount for that in the newsletter. The mini Snacks are one-third the size of a regular Lotus ball: 85 yds per 33 g. Not one-half. CORRECTION: A Six Pack O’ Snacks totals 512 yds, not the 768 yds I stated in the newsletter. Page one of Andee’s pattern. Isn’t it pretty? See my drawings above in that photo of my light blue swatch? That’s me figuring out that a two-ball (same as six Snacks) Shining Day would come out to 12″ X 51″ (or a bit longer). My swatch is 11.5″ wide. I needed 46 foundation stitches to do 4 stitch pattern repeats. Andee’s Shining Day pattern is definitely worth paying for if you miss the free version. It includes stitch charts and a photo-tutorial on making the picots. Join the CGOA MEGA CAL group in Facebook! Yesterday’s issue 88 of Vashti’s Crochet Inspirations Newsletter had only enough room for yarn over highlights. Who knew I’d discover too much material for a newsletter? I described the basics of yarn overs and yarn unders in the issue already, but that only goes so far. Yarn overs are actually kind of tricky—at least when you think about them and watch yourself in slow motion. I see this in classes. Yarning over is one our most ingrained habits. Prefer a video to the close-ups above? I like PlanetJune’s. This can also happen if the loop falls off the hook while crocheting the chains and twists before you place it back on the hook. Another thing about yarn overs is the rotational movement. It would be easier to describe them if they were linear (just move your hook along a line from point A to B). Instead, we describe what the hook’s motion is, or focus on the yarn’s motion: a “yarn under” is also a “hook over”. Some describe the motion as clockwise vs. counter (anti-)clockwise, which adds its own ambiguity. The motion your hook and yarn make for a yarn over is counterclockwise…IF you’re looking at it from the shaft end of the hook and IF you’re crocheting right-handed. The same motion suddenly appears clockwise if you watch it head on (from the head end of the hook). I’ve swatched several kinds of familiar stitches with yarn unders instead of yarn overs. The stitch didn’t always look different, but in every case, it’s denser and tighter. I struggled at times to maintain an even gauge and to loosen up, depending on the stitch and yarn. When I’ve preferred the feeling of using yarn unders, they seem lean and efficient, like taking a shortcut. It’s tempting to use yarn unders when finger crocheting and when completing reverse single crochets and loop/fur stitches. I’m sure a large project with them uses up less yarn! Usually I prefer yarn overs though. I’m used to rhythm of it and the control they give me over my gauge. Sometimes they feel sort of “luxe” or fancy, compared to yarn unders. If you want to do the old style slip stitch crochet that is so dense it’s waterproof, use yarn unders! The single crochet stitch (sc, or UK: dc) requires just two yarn overs and is visibly affected by changing just one of them to a yarn under. I expected to find yarn unders in Mark Dittrick’s Hard Crochet book on sculpturally stiff sc. Change just the second yarn over and you get what Rebecca Medina‘s modified sc for tapestry crochet. Here’s another interesting reason to use some yarn unders for your sc. In her Freeform Knitting and Crochet book, Jenny Dowde recommends alternating a yarn over with a yarn under when starting a surface sc. Doing this prevents the raised row of sc from slanting to the left or right. Two other stitches that show off yarn unders nicely are half doubles (hdc or UK: htr) and love knots. See the issue for more on those. View the hdc swatch diagram from the issue in high resolution. A newsletter subscriber mentioned to me that the designer Aoibhe Ni uses yarn unders for special texture effects in her lovely Tunisian crochet designs. How Many Types of Yarn Overs? A method I used for the Five Peaks Shawl. I think of yarn over types in terms of how to get more yarn on the hook for making stitches. So we have the two obvious types: wrap it one way (Yarn Over), or the other way (Yarn Under). A third way to add loops to the hook is the crossed loop, which is a simple cast-on in knitting. It’s also a half hitch in macramé. This loop has a twist in one direction or the other, so there are actually two types of them. I used them for Tunisian crochet to increase stitches along one edge of the Five Peaks Shawl. This kind of loop was the subject of one of my earliest newsletter issues: “A Very Different Kind of Crochet Stitch“. I love Sue Perez’ “Forward Loop Chain” blog post about them. The yarn-to-front (ytf) shows at the top of this page with the two yarn over types even though strictly speaking it isn’t one. It’s easily confused with the yarn under. I mentioned Jane Rimmer in the issue because I want to make sure you know about her two-part article for CGOA’s Chain Link newsletter: “Yarn Over History and Technique” (Autumn 2014) and “Yarn Overs Part 2: Techniques” (Summer 2015). Its tentative name is Graven because I first thought of raven’s wings, and it has an engraved-looking texture. I think the last all-black thing I designed was a 2007 mini skirt of single crochet for Caron yarns in their Simply Soft yarn. Early (earliest?) Wicker variation swatched. The main stitch pattern is similar to one I created for Weightless and Liebling. I’ve planned to design with it for years. I chose short rows to shape it instead of steadily increasing in the round from the neck down, or gathering the neckline. This made it an interesting process. A recent “Glamgloss” ad by Valentino inspired the design idea. Originally I was going to name it “Glaze” or “Lotus Glaze”. It evolved and now will probably be more of a capelet to be worn open in the front or closed in the back. Last night I tried out the edging you see here. It blocked overnight and today I’m very happy with how it resolved some issues. Give it a restrained but special design detail. The stitch choices are very carefully picked to deal with how the hem hangs. This is my top priority because I feel like a little girl if something ruffles even slightly over my upper arms. Some of the stitches recede to create a subtle ribbing effect that pull the hem in just enough. I like the vertical texture they add. The tiny twisted loops (the shortest I could make them) are actually energy coils that add resilience to the flexy rib, since this yarn has no wool or other stretchy fiber in it. The picots I tried didn’t do this. It’s also dense enough overall to weigh down the hem without the need for beads or a hidden chain. Close up of the change in stitch pattern for the collar, in progress. These are twisted Tunisian crochet stitches. I first used a twisty loop edging for Aquarienne, my newest published pattern. For that design they’re beaded and a bit longer. For the neck edge I used a different stitch pattern while crocheting the main piece. You’re looking at twisted Tunisian extended stitches. Interesting texture! I haven’t used them like this before. If/when I write up Graven as a downloadable pattern, it will be for an Experienced skill level and with a video. This is mainly due to what it’s like to do the main Tunisian mesh in short rows. Graven has a project page in Ravelry where I’ll post updates. Want to see some stitch patterns change when the yarn color changes? The two-color Tunisian crochet swatches are for my class handout (yes, still working on them!). I needed to clearly distinguish the forward row from the return row, so I color-coded them. I didn’t expect to like them so much! The one-yarn versions are below their two-color swatches. Top row: two-color swatches. Bottom row: their one-yarn versions. Isn’t it fun to see how just alternating colors in a simple stitch pattern can give it a fresh look? Sometimes a swatch needs to convey more than words when space is a premium (such as in a class handout). Color-coding really helps. on my crochet conference readiness: only ONE class handout left to send to the tech editor! That’s FOUR down, one to go. My goal is the end of this week. Then you’ll start seeing blog posts of other topics like new Lotus yarn colors, or Charleston. Today I get to crochet outside in my gazebo. The weather is gorgeous and the birds sound happy. We have plenty of coffee, chocolate, and fresh peaches. It’s a perfect holiday weekend. On the hook: very special practice swatches. What? Well, we’re nearing the end of May. One of my big conference prep goals is to complete the handouts for all five of my class topics by June 1. That’s why I keep blogging about how I prepare class handouts. It’s all I can think about. It’s like when I’m in the midst of solving a puzzle, or reading a good mystery. Practice swatches try to become new designs! I’m an unofficial pattern tester today, following my own directions in a class handout so that I send off the draft to my editor and pattern tester. I hope this doesn’t sound like work to you. It’s very exciting! So many designs happen this way by accident! Translating a class topic into ideal practice swatches for students is creatively inspiring. For the Steeked Tunisian Lace class I designed a few short practice swatches that build on each other. It’s inspiring to compare these three basic ways to crochet the lacy extended stitch net: with 1 yarn (Seshen is a great example), or alternating 2 yarns (Mesmer Scarf), or the double-ended hook variation (á là Maze Vest). In class we’ll then have practice swatches to steek! Why this May 31 deadline? It gives my editor enough time to go over the three new handouts. It also gives me time to incorporate her revisions without feeling rushed. My close friend Annie arrives from Kentucky in two weeks. I can’t wait to see her! I don’t want to be mulling class handouts while she’s here. It’s for the best that I expect that the conference will sneak up on me. It always does. Plus, this is the first year I’ll have a booth while teaching.